When last season’s finale skipped ahead five years and offered us a look at what The 100 might look like after Praimfaya, there was a ton of promise. It was an exciting cliffhanger for a finale, but more importantly it was a much-needed jolt for the storytelling. 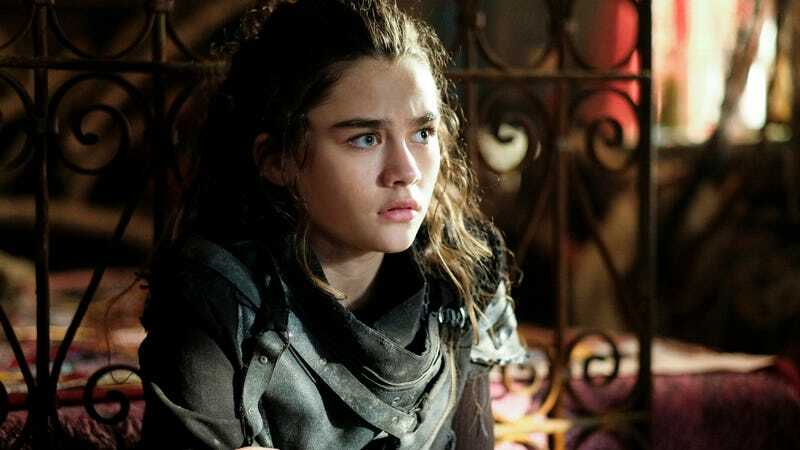 The fourth season of The 100 vastly improved on the shaky third season, but one got the sense that something needed to change. Another year of the same people fighting for the same reasons wasn’t going to cut it. Scorching the earth was a reasonable solution, and a way to put familiar characters into new situations and, ideally, provide fresh storytelling options. The optimism inherent in that cliffhanger, in terms of the show’s path forward, lingered through season five’s first few episodes, as we got to see Clarke, the bunker survivors, and the crew on the Ark live in a new reality. Any semblance of progress had ceased, and the characters we had come to know and love were suddenly thrust back into the most basic throes of survival. As an added wrinkle, each group was dealing with its own challenges. The promise came from the way the show could tie in the backstory of those five years and use it to drive new conflicts. As the season’s unfolded though, that jump in time has become rather questionable. Jumping ahead five years is still the necessary choice, but as the season’s gone on the plots have dragged and it’s difficult to pinpoint exactly why that is. Part of it is the familiar storytelling; we’re still getting stories that explore difficult decisions and life-or-death stakes, but without the more personal, intimate touch of earlier seasons. Instead, everything is more expansive, and while broadening the scope of the show is certainly an admirable choice, it’s also resulted in episodes and conflicts that don’t feel rooted in character, but rather overarching ideas about war and violence. 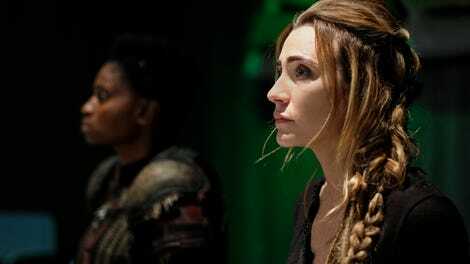 That kind of storytelling certainly has its place, and The 100 is a show that often excels at it, but with each new episode this season there’s been the sense that we could use a lot more backstory to understand the current conflicts and, more importantly, character motivations. This is where the Dark Year comes into play. It’s been looming large all season, a year in the bunker only spoken about in hushed tones while furtive glances are exchanged. The sense then is that the writers have been building to this week’s episode, asking us to wait for the events of “The Dark Year” to take place in order to fully understand why Octavia is such a brutal leader, or why Abby is suffering from addiction. To the show’s credit, “The Dark Year” is one of the better episodes of the back half of the season. It brings together a lot of the season’s disparate threads in a way that feels interesting and complex. Clarke’s motivations, shaky and undercooked to this point, are made clearer as she tries to detox her mother while slowly coming to understand that the very person she’s trying to protect doesn’t agree with her strategies. Bellamy and Octavia’s feud doesn’t exactly come to a head, but there’s the sense in this episode that they’re resigned to their fates. Their fatalism is incredibly poignant, and both Marie Avgeropolous and Bob Morley imbue their scenes with plenty of heartache and genuine emotion. At the same time though, “The Dark Year” feels like it’s coming too late in the season, and the flashbacks don’t do enough to truly add insight into what these characters have been through. Don’t get me wrong, the flashbacks are brutal and effective. The idea that Wonkru had to eat its own people to survive is a believable one, and The 100 handles the horror of it all in a way that feels terrifying without veering into exploitation. And yet, the decision to filter it all through Abby’s addiction is a curious choice. Abby has always been a clear-eyed moral leader, so the reveal that she was the one who suggested the cannibalism and pushed Octavia to kill anyone who refused to eat their own people is a bold, intriguing move. Again though, it seems to come too late in the season. Up until now Abby has been nothing but a “junkie,” to use McReary’s term, and her storyline has bee the weakest of the season. Knowing what she was reckoning with from the Dark Year could have bolstered her storyline and allowed for storytelling that wasn’t coy, but rather emotionally impactful. Perhaps The 100 can recover though. “The Dark Year” put all of its pieces into place for a final confrontation between Wonkru and McReary’s army, with the added stakes of them fighting over the only livable land they know. That could mean a final two episodes imbued with personal stakes, or a retread of previous seasons. So it goes with The 100. “I love you Clarke, but we’re on the wrong side of this war.” Madi is full of wisdom in this week’s episode. Madi pulling out the Mount Weather knowledge to shame Clarke is some truly great character-based conflict.